Hatters boss Nathan Jones has hit back at Exeter defender Dean Moxey after the Grecians player labelled Luton a ‘cocky bunch’ in his online column last week. The City full back, writing for DevonLive.com after Town had romped to a 4-1 victory at St James Park, said: “I didn’t much care for the way Luton went about things. So I just say to Dean Moxey, it won’t affect what we do, but just concentrate on your own thing. “Take it from me, they’re a cocky bunch who, rather than let their football do the talking, did everything they could to wind us up. That didn’t sit well with Jones though as when asked for his reaction to those comments, the Luton chief said: “We have a wonderfully hard working, humble group of players. “When they go on the pitch, things happen and I’ve come up against some really nice human beings that are real terriers and real difficult people on the pitch, but it’s on the pitch. “So anything that happens on the pitch, happens on the pitch. “So to Dean Moxey, and I’m not worried about him calling us cocky and stuff, what I took liberty with or what he’s taken liberty is, is that he hopes we come unstuck. “Well, that’s not right, that’s not good. “We don’t care who else does well or who does badly, we don’t look at it, what we do is concentrate on ourselves. “So I just say to Dean Moxey, it won’t affect what we do, but just concentrate on your own thing. “You concentrate on your own thing and I’m sure you’ll be fine, but don’t comment on Luton, don’t comment on us and what we do well or what we do badly, as that will only give this team motivation. On whether Moxey had made a rod for his own back when the Grecians head to Kenilworth Road next year, Jones continued: “Well, I don’t know, they don’t come there until February, so maybe we’ll forget about it by then. “But we don’t comment on anyone else, or hope that anyone else does badly. “What we do is we hope we win our games and then whatever else happens, good luck to anyone else. “People get what they deserve in football. If you work hard, you get the right things, then hopefully you’ll succeed and get what you deserve and that’s what we have. “So he might comment on us, but we’re a good group and we’re an honest group and they’re a hard working group and they’re good human beings and they’ve very humble, on the pitch. Captain Scott Cuthbert was quick to laugh off the comments as well and actually felt it was paying the Hatters the respect they deserve for being at the summit this term. 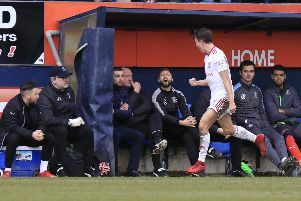 He added: “Things happen in games, the little (Crawley) striker was having a dig at me during the game trying to get a rise out of me (on Saturday). “I think Hylts (Danny Hylton) or Collo (James Collins) maybe had a little nibble at Moxey and he took a little bit umbrage there, but that’s part and parcel of the game. “You get it and sometimes you lose the argument, sometimes you win those arguments. “I don’t think it helped that Hylts nutmegged him as well, so I think it’s a bit of sour grapes. “It’s nothing, just emotions running high after the game and those things happen. “It’s a bit harsh (hoping Luton will come unstuck), but my best mate plays centre mid for them, Lloyd James the captain, and he was after the game saying as well, how much he hates us as a team. “But that’s what happens when you’re winning. “You look at your Man Us and Arsenals that were dominating the Premier League year on year out. “Everyone hated them, everyone wanted to beat them, everyone wanted to knock them off that perch. “I’m not liking ourselves to those kind of teams, but we’re at the top, we’re there to be shot at and the way we’re going just now, bring it on so to speak.